The Grand Rapids Audubon Club has maintained bird count records dating back to 1953. I began placing the data on an Excel spreadsheet in 1986 when I became count co- ordinator and added the historic data sometime during the 1990’s. That is 64 years of data tabulated. I use the data when summarizing the current year’s count by looking for interesting comparisons and include a couple notes for the published summary report. It would be helpful for someone to proof the data entries and help get the tabulated data in order so it can be made available for distribution or printing. Let me know if you are interested in such a project. You can come to Ody Brook Nature Sanctuary and we can plan the project. Join bird count participants at 7:30 a.m. on December 29, 2018 at Wittenbach/Wege Agriscience and Environmental Center (WWC), 11715 Vergennes Rd. in Lowell, Michigan 49331. Field teams are organized and depart by 8:00 a.m. They return around noon for lunch. Joan Heuvelhorst will prepare a lunch. Lunch cost is $5.00 or you can bring yourown. At 5 PM, section ndings are collected. Participatepart or all day. Participation is free with donations sent to support the National Audubon Program. This citizen science project is great for introducing fami- lies to bird discovery and is fun data collection. It is a way for families to do meaningful things together outdoors with help from experienced birders. Have a great time enjoying birds, birders, and gathering data useful for tracking bird locations and species abun- dance. Individual teams see about 25 to 30 species and when all teams’ data are compiled, we total around 55 to 60 species sighted. I hope you are enjoying your domestic Thanksgiving tur- key dinner today. Wild Turkeys were mostly killed by over hunting and disappeared completely from Michigan and from most of North America. There were about ten million in the North American in the early 1800’s. By the early 1900’s they had been killed to near extinction. Only about 2 percent survived in widely scattered areas and were unable to rebuild their population. People became aware of the disappearance and tried to remedy the problem. Hunting regulations were enacted but failed attempts to capture wild turkeys for reintroduction to suitable habitat nature niches were problematic. By the 1950’s an effective method for capturing turkeys was de- veloped using a cannon net. In the 1980’s I participated with the Michigan DNR in a release of wild turkeys in the Rogue River State Game Area. Later a DNR wildlife biologist called me to learn if I could provide information about the success of reintroduc- tion from the small number released. By serendipity, the night before I saw 97 turkeys cross the road in front of my vehicle as I went home from the Howard Christensen Nature Center where I was director. Ten years ago, at Ody Brook on Thanksgiving when our relatives were gathered and eating domestic turkey, 21 wild turkeys paraded through the front yard. Species are declining for a variety of reasons while many politicians work to weaken or dismantle the Endangered Species Act. Vigilance is needed to protect species and nat- ural resources for our present and future wellbeing. Ranger Steve(Mueller) odybrook@chartermi.net 616- 696-1753. Natural history questions or topic suggestions can be di- rected to Ranger Steve (Mueller) at odybrook@chartermi. 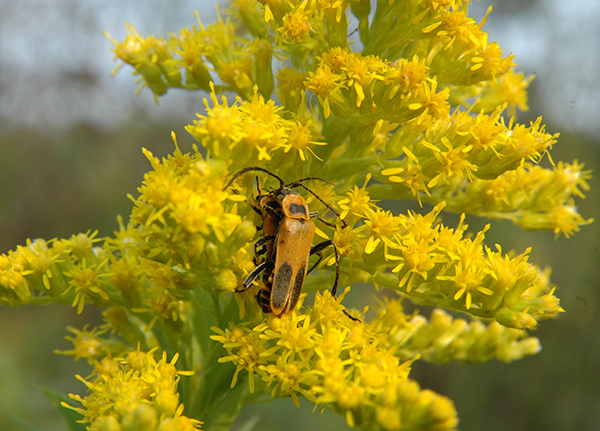 net – Ody Brook Nature Sanctuary, 13010 Northland Dr. Cedar Springs, MI 49319 or call 616-696-1753. Are you a window watcher? That means most of your bird watching is done through a window. Much of my birding is casual with glances out the window. I used to leave for work before sun up and arrive home after dark. I still fed the birds all winter for their benefit even though I was not present to enjoy them. On occasion, a friend and I travel to interesting locations in West Michigan to see birds that are not found in our yards. Lake Michigan shoreline is a great place to see winter waterfowl. Binoculars are needed. A closer view in the open water where rivers like the Grand and Muskegon empty into the big lake provide good views. During the winter, my friend and I pick a January or February weekend when we can make a trip to the Upper Peninsula to enjoy the snowy scenic beauty and birds that do not come this far south in winter. The Boreal Chickadee, Gray Jay, Northern Hawk Owl, and Sharp-tailed Grouse require us to visit their winter range to see them. This is referred to as “target birding” where people go somewhere to see a specific species. Birds end up in places where they are not expected. Some have been seen only a few times in our region. Why they are there is a mystery. Perhaps their navigation system has been confused. Their survival can be precarious. We observed a Rufous Hummingbird visiting a sugar water feeder the last week of December one year. The home owner saw a hummingbird and promptly put out a feeder to help it survive. It stayed for a couple weeks before disappearing. It was never known if it made the trip south or died in the stark cold winter weather. The Rufous Hummingbird is a western species that winters in the extreme southeastern states or farther south. 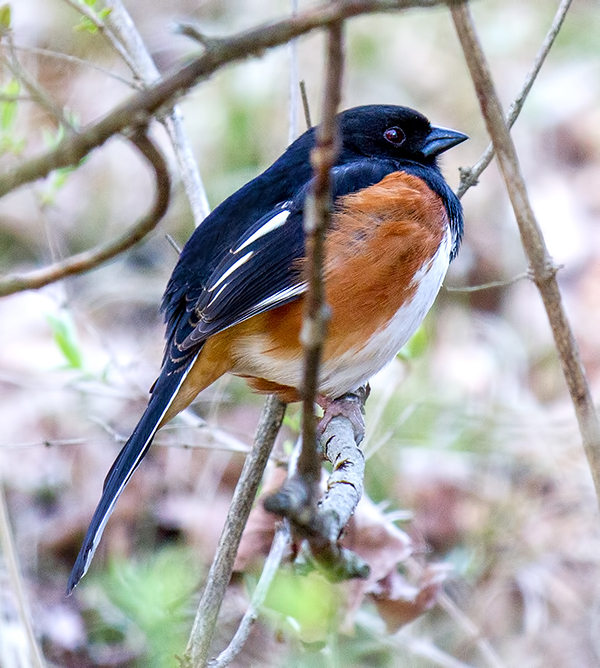 I find exploring bird nature niches an exciting and rewarding endeavor that can shed new information for understanding bird behavior, ecological adaptations, and normal daily habits. Forging my way into difficult areas people tend to avoid is fun and challenging but reveals things not generally observed. The American Woodcock has a wonderful ground dance followed by an aerial spiral flight, plunges toward the earth, levels before crashing and resumes the ground foot stomping and spinning display at dawn and dusk. This can be observed during the late March and April breeding season at Luton Park and many area locations. We manage habitat for the bird at Ody Brook and always enjoy its performance. I occasionally keep records of the vocal calls called peents during the ground dance between aerial flights. They vary from a few to more than fifty. Peents increase in number as dark settles in. I note where they land and what they do on the ground. A different kind of birding is to discover woodcock activity before their breeding displays begin. I have tried to determine how early they arrive north. In late February and early March, I have forced my way through thick swamp shrubbery in hopes of flushing one when thick snow still covers the landscape. Trudging in such habitat is not easy and I have never encountered another person on such adventures. To my joy, I have come upon a woodcock feeding along a tiny rivulet of open water where it can probe its long bill in to mud in one of the few places where food can be found at that time of year. My observations indicate the species returns earlier than most people expect but they remain hidden and focus on feeding and shelter until breeding time. Another different kind of birding is documenting where nests are constructed, how many eggs are typically laid, the height of nests, plant species used for nest placement, and behavioral interactions with their own species and others. I waded in a marsh from nest to nest during a Red-winged Blackbird nesting season. Attached is an abbreviated table of observations from that venture into the wild wet world of blackbird nesting territory. Some data fields were deleted for space limitations and to prevent losing your interest with too much information. I keep bird nest records annually as shown in the accompanying sample table. That year I had records for 65 nests. This year, I have records for 49 nests. Downy woodpecker using its specially adapted feet to hang onto the tree, even upside-down. Photo by National Wildlife Photo Contest entrant William Osterloh. Red-bellied, Downy, Hairy, Pileated, and Northern Flickers are common woodpeckers present at Ody Brook and in many wooded neighborhoods throughout the area. Some are seen more frequently than others. Downies are seen daily when visiting suet and black oil sunflower seed feeders. The males have a red spot on the back of the head, females do not, and young males have red on top of the head. Watching for color and feather patterns from the comfort of your home is easy. I combine watching with breakfast and lunch. Feeder watching is a casual activity. On the windowsill is a pair of binoculars within reach so I can quick get a better view. Some details are difficult to observe without aid. The white spots on black wings of the Downy and Hairy Woodpeckers helps narrow identification quickly to those two species. Body size and bill length further help distinguish the two that have nearly identical patterns. Somewhat hidden is black flecking on the underside of white tail feathers of Downies. The under tail feathers are pure white on the Hairy. From a top view, the tail is black on both species except for white outer tail feathers that might show black spotting on Downies but it is sometimes obscure. Binoculars help get a look at the under tail. The black flecks are a definitive identification feature. The birds are not always cooperative in how they stand on the feeders for me get the view I desire. Other features helpful for separating the two species is their bill and body lengths. Downies are smaller and shorter than the Hairy. Bills on Downies are less than half the length of the head. The Hairy Woodpecker bill is large and greater than half the length of the head. This feature can be difficult to assess so using the black or lack of black spotting on the under tail is more reliable. The Red-bellied Woodpeckers have white markings on a dark back but theirs appear more like white irregular lines running crosswise. These birds are much larger than the Downy or Hairy. Some people confuse them with Red-headed Woodpeckers that have completely redheads while the Red-bellies only have red on the back of the head in females and on the top and back of the head on males. When they fly, a muted white can be seen on the rump. A more obvious white rump is distinctive on the Northern Flicker. Flickers in our region are the yellow-shafted subspecies that display flashes of yellow on wing feather shafts in flight. If large trees compliment the neighborhood, you might get to enjoy the crow sized Pileated Woodpecker. It is mostly black but flashes white in flight and it stands on the sides of trees. Crows need branches for standing. A zygodactyl toe helps all woodpeckers stand on the side of trees. It is an important nature niche adaptation. Nearly all bird species have three toes facing forward and one backwards. Woodpeckers also have three toes pointing forward but one of those is flexible enough to rotate so it can be pointed backwards. When toes are positioned with two forward and two backwards, it provides a better anchor for gripping the tree trunk when the birds bang their beaks against the bark. 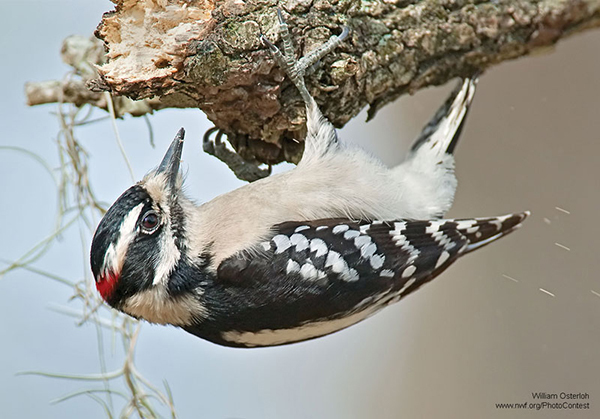 The flexible zygodactyl toe is a significant adaptation aiding woodpecker survival. The exceptional toe is not unique to woodpeckers. Owls have one that helps them with the capture and holding of prey. Parrots share this unique feature but we will not see those birds in this cold climate. Seeing the toe adaptation in action is difficult but a pair of close focusing binoculars will make it easier to observe when birds perch on the side of trees or at feeders near the window. Something special is always waiting to be discovered in the yard by those observing the wondrous creatures that abound. Plan an evening of enjoyment with a presentation by Clayton Daughenbaugh titled “A Wilderness Icon: Utah’s Red Rock Canyonlands.” It will include a multimedia program narrated by Robert Redford. Sorry, Bob will not be here to present his portion of the program but it will add to Clayton’s information and spectacular images. I have been a member of the SUWA since its founding and have written about this special place in nature niche articles. The new species I discovered (Grammia brillians) in 2005 resides in this wilderness. I am confident other new species live in the fragile and unique environment. Come discover the wonders of a wild place that deserves protection from short term despoliation that will impair one of the most special places on Earth. The few wild places like this will become more important for future generations. They are currently vital for recreation, science, and wildlife. In the future, these values will become more significant if they survive. Directions: from north Kent County: Travel south on Northland Drive that becomes the East Beltline. After crossing I-96, turn right (west) on Fulton and travel to Woodward Lane on the Aquinas College campus. Turn left on Woodward (south) and proceed to the parking lot on the right. The parking is immediately south of the conference center. Map: https://www.aquinas.edu/sites/default/files/2017%20AQMap_OUTLINE_FINAL.pdf or use Mapquest. Fall is a good time to plant trees. Here, I am known as Ranger Steve. When I took middle school students to Costa Rica from Kent County, we worked with students from their communities to plant trees in damaged rainforests. There I was called Guardabosque Esteban. As “forest guard Steven,” the effort was to help young people learn how to protect the environment that supported community health, water, and the economy. Our students were paired with Costa Rican students and they planted nursery-grown trees. It was a wonderful experience for all, including the trees that could establish a good root system in a suitable nature niche. Here at Ody Brook Nature Sanctuary our girls planted trees yearly. We planted seedling Christmas trees to harvest for our personal use. In order to harvest a tree at Christmas, it was required we plant trees so they would learn how to maintain a sustainable supply. Another ranger naturalist did not carry a watch. 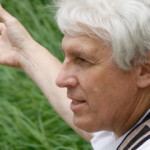 To be on time to lead guided walks, Steve Carlisle used the sun to tell time. He asked park visitors for the time to make sure he was on time for his duties. Being outdoors daily allowed me to learn to tell time within 15-minutes by the sun’s location. It is an accuracy skill I have lost by not staying in practice. Like lure casting, volleyball, golf, or canoeing, one must stay in practice to be proficient. I carried a watch as a backup tool to meet arrival responsibilities for park ranger work assignments. The watch is more accurate than the 15-minute accuracy I developed by sun watching. The sun does not rise at the same time daily. It is in a slightly different location along the Zodiac path as the Earth moves around the sun creating yearly seasonal progression. That is a reason weather forecasters post daily sunrise and sunset times. It is the Earth’s rotation that makes it appear that the sun moves overhead daily. The Earth revolves around the sun on a 365-day journey. Revolution is responsible for the shift in the sun not rising or setting at the same time daily. It complicates telling time accurately. People living before the sundials or watches, paid close attention to the sun’s position. It helped them arrive home before dark and allowed them to plant crops when it was reasonably safe to avoid killing spring frost. Begin practicing telling time by looking at the sun at sunrise and compare it to clock time. Every 15 minutes check your watch and the sun’s position. It is best to practice during the early or late hours of the day. During the evening, start observing one hour before the time weather forecasters indicate the sun will set and check its position at fifteen-minute intervals. Soon you will not need to compare time with a watch. It is important to use early or late day observations when it is easier to gage the celestial position compared to objects like the horizon, hills, or trees. Those hours allow us to relax and enjoy how the sun plays into our own nature niche activity routines. Enjoy the beauty of changing light on clouds. Notice cloud silver linings and experience colors deepen and change as the sun dips below the evening horizon. When the sun’s lower edge first touches the horizon, time how long it takes for the ball’s top edge to slip from sight. Always be careful when looking toward the sun. Quick glances are essential. Special viewing glasses are available. You might still have a pair that was provided for observing the solar eclipse. Early and late day observations are safest because sun intensity is reduced by atmospheric interference. Its light must past through more atmosphere and suspended particulate matter before reaching our eyes. The sun appears larger during those witching hours because of atmospheric light dispersal. Even more importantly, there are objects to compare with the sun like trees and hills that make it appear larger at that time of day. When the sun reaches high noon, it is the same size as when rising or setting but it looks smaller because we lack objects for comparison. Telling time to fifteen-minute increments midday is more challenging without objects for comparison. It can be done but takes more practice. Telling time in half hour increments is more reasonable when the sun does not have nearby comparison objects. It is fun to use the sun in ways that were required by early civilizations. It creates more independence from human tools. Become more self-sufficient. Celestial objects were used as maps before paper and ink or cell phone Apps. Free Apps can be downloaded for identifying constellations. They do little to help us understand how to tell time by observing the sun. Apps do not connect us with natural world in a manner sky-watching can for developing time telling skills. Connect with the real world while enjoying the everchanging sky. Take time to practice telling time using the sun’s position and later use stars to determine where on Earth you are and how to navigate without modern technology. Depend on your skills instead of someone else’s.